Students listen in 10 a.m. chapel as Dr. Allen McFarland talks about diversity and making a difference. Anna Bolton | Greene County News Dr. Allen McFarland, senior pastor of Calvary Evangelical Baptist Church in Portsmouth, Va., speaks during chapel Jan. 21, Martin Luther King Jr. Day, at Cedarville University. Cedarville University students, faculty and staff members bow their heads in prayer. CEDARVILLE — A Virginia pastor encouraged Cedarville University students to be “difference makers” on the day that celebrates the life of one particularly great difference maker — Martin Luther King Jr.
Dr. Allen McFarland, senior pastor of Calvary Evangelical Baptist Church in Portsmouth, Va., spoke about the civil rights leader during chapel Jan. 21 at the university. In 2012, the Black Christian News Network named McFarland one of the nation’s 70 most influential black Christian history-makers living today. He founded Angelos Bible College in Portsmouth in 1984, and is currently its chancellor. McFarland also has a radio ministry, “The Joyous Sound,” broadcast on a Portsmouth radio station. In 1995, he established the Joyous Sound Education and Enrichment Center, which currently enrolls children, pre-K through third grade. During chapel, the pastor encouraged students to rejoice in their youth, remove sorrowful things from their lives, and to remember God. 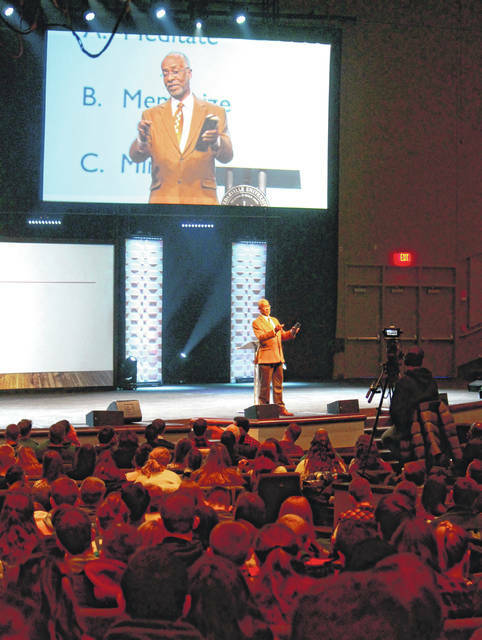 Cedarville University President Thomas White told the Gazette that the speaker provided a good opportunity for students to start good conversations, and urged them to get to know someone different than themselves. McFarland also spoke about diversity. “The world is much larger than you. We shouldn’t be self-centered. We need to be actively involved with others all the time,” he continued. McFarland briefly referred to the time he participated in the civil rights movement and went to jail for demonstrating. 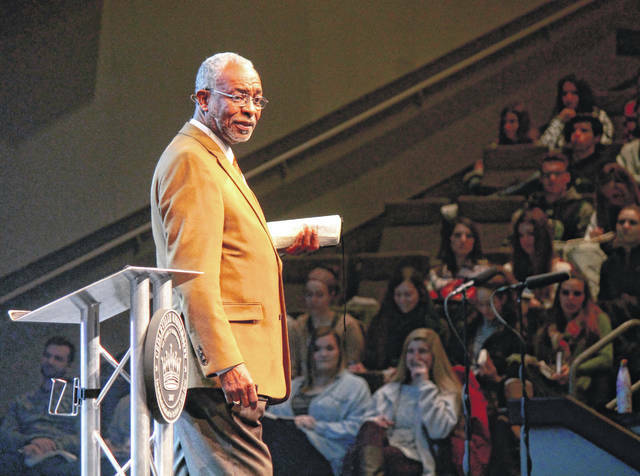 https://www.beavercreeknewscurrent.com/wp-content/uploads/sites/49/2019/01/web1_CUchapel.jpgStudents listen in 10 a.m. chapel as Dr. Allen McFarland talks about diversity and making a difference. https://www.beavercreeknewscurrent.com/wp-content/uploads/sites/49/2019/01/web1_Pastor.jpgAnna Bolton | Greene County News Dr. Allen McFarland, senior pastor of Calvary Evangelical Baptist Church in Portsmouth, Va., speaks during chapel Jan. 21, Martin Luther King Jr. Day, at Cedarville University. 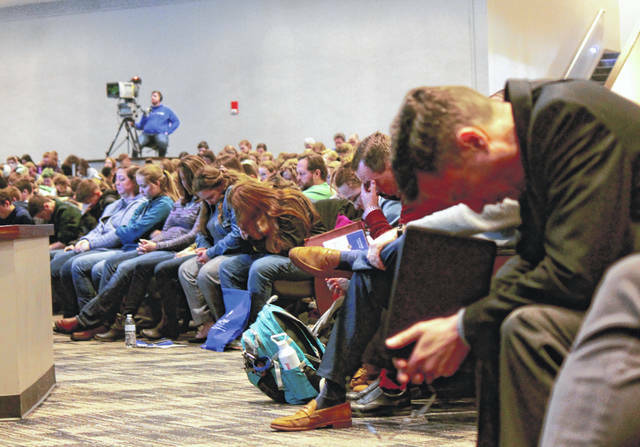 https://www.beavercreeknewscurrent.com/wp-content/uploads/sites/49/2019/01/web1_Praying.jpgCedarville University students, faculty and staff members bow their heads in prayer.